Need to remove an oil stain from your driveway? Want to get rid of cobwebs and dirt from your home’s brick exterior? Cleaning hard surfaces on your property is not a problem when you call Special Ops Clean Team. We offer peerless results in Phoenix, AZ, when it comes to surface pressure washer cleaning. Our dedicated team is willing to get down and dirty to take surface cleaning to an all new leveland achieve the most thorough clean possible. Call us today to learn how pressure washing can transform and restore the curb appeal to your home! When should I use a pressure washer? Deposits from rain runoff and melting snow can streak your patio, front walk, or driveway. Similarly, oil leaks from cars and residue from barbecues also leave their mark. Trying to hose away or scrub away these messes won’t make a difference. What you need is a powerful tool that can remove stubborn particles in the hands of a trained professional. Don’t surrender to stains on your property.A clean property looks more professional and aesthetically pleasing and will help you meet any HOA requirements. Special Ops Clean Team targets visual nuisances by surface cleaning each and every square inch that you want to reclaim from the world of stains. 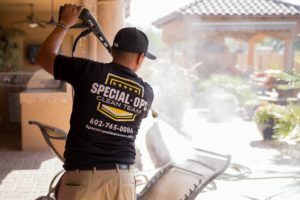 Why should a professional power wash my property? If you’re not trained on how, when, and where to use a pressure washer, you could end up damaging your property, breaking the equipment, or harming yourself. Don’t take the risk of using a pressure washer improperly and ruining your patio, driveway, or home’s exterior. The professionals from Special Ops Clean Team know exactly how to use this specialized cleaning tool to blast away stains and restore your home’s appearance. Don’t wait for the stains and buildup to get worse on your home’s hard surfaces. Contact us and watch our over 20 years of experience go to work for you. Power washing your home regularly is a smart way to upkeep your property.The more frequently you tend to your hard surfaces with a pressure washer, the more protection you offer them for the long haul. So, invest in your property with power washing services from Special Ops Clean Team. Our budget-friendly prices mean you can’t afford to let an opportunity for maintaining your home slip by. Here at Special Ops Clean Team, we pride ourselves on being organized and thorough and have a commitment to excellence and client satisfaction. More than two decades of providing only the best cleaning services make us the most reliable cleaning company in the Phoenix, AZ, area. We can do everything, from pressure washing your driveway to cleaning your carpet, disposing of construction materials, and more. Whether you need the interior or exterior of your residential or commercial property cleaned, Special Ops Clean Team is ready to go. Call us today to get an estimate on our cleaning services! Call us at (602) 765-0086 for more information or to request an estimate.